When deploying a Windows Server 2019 Network Policy Server (NPS) to support a Windows 10 Always On VPN implementation, administrators may encounter the following error when attempting to establish a VPN connection on a remote Windows 10 client. Can’t connect to [connection name]. 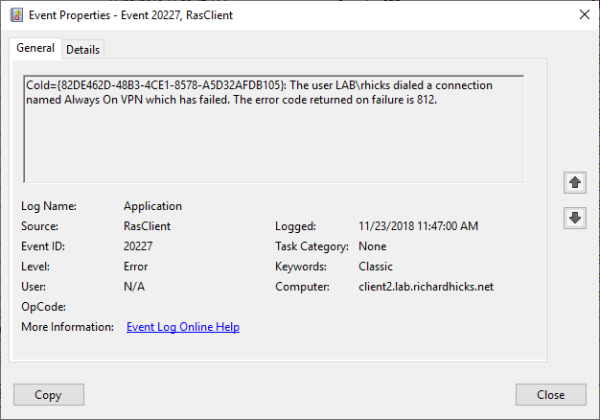 In addition, an event ID 20227 from the RasClient will be recorded in the application event log with the following error message. The user [username] dialed a connection named [connection name] which has failed. The error code returned on failure is 812. Many of the Microsoft AD cmdlets have a –Filter and an –LDAPFilter parameter. So what’s the difference? Language syntax. The PowerShell Expression Language syntax provides rich type-conversion support for value types received by the Filter parameter. The syntax uses an in-order representation, which means that the operator is placed between the operand and the value. For more information about the Filter parameter, see about_ActiveDirectory_Filter. Specifies an LDAP query string that is used to filter Active Directory objects. You can use this parameter to run your existing LDAP queries. The Filter parameter syntax supports the same functionality as the LDAP syntax. For more information, see the Filter parameter description and the about_ActiveDirectory_Filter. Hello, sandwich fans! It’s been awhile since I’ve written, but I have some fresh deli meat for you today. If you recall, last year I wrote a blog post about setting up VMware, Synology, and iSCSI MPIO. It turns out to have been my most-read post so far, for which I thank you. Since I’ve gotten such positive feedback, today I’m going to show you a similar setup, but this time I’m going to use NFS instead of iSCSI. I often use the EMP and DEPT tables for test and demonstration purposes. Both these tables are owned by the SCOTT user, together with two less frequently used tables: BONUS and SALGRADE. Execute the below code snippets to create and seed the EMP and DEPT tables in your own schema. The BONUS and SALGRADE tables are included as well, but are commented out. The DDL (data definition language) part creates the tables, the DML (data manipulation language) part inserts the data. MultiPoint Server (MPS) is a technology and solution based on Windows Server and Remote Desktop Services. MPS was originally built for use in the classrooms and educational institutions and It allows you to provide low-cost sharing between MPS and user stations. User stations can be consist of only monitor, keyboard, mouse (zero clients) and be connected to MPS through USB (usb hubs), video cables or through LAN (RDP-over-LAN, if clients are not zero. for example, laptops, thin clients and etc..). MPS uses some of the RDS services (by default): RD Session Host and RD Licensing Server. First version of MPS was released in February, 2010 . In MPS 2010 you can connect stations and host only through USB hubs and video ports. Ability to use LAN between user stations and MPS was added only to the next version – MPS 2011 released in March, 2011.